Running an affiliate program in today's market requires a stable, scalable platform which is highly configurable and allows you to run your program how you see fit. 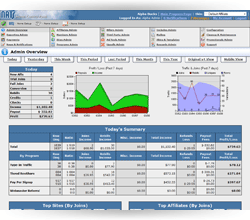 NATS lets you analyze and maintain affiliate relationships, deliver and track advertising tools, configure unlimited offers, and generate detailed reports. 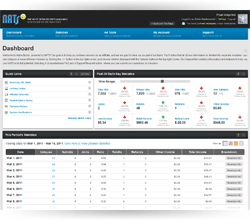 Attract the best affiliates possible with our powerful analysis tools and our overhauled, intuitive affiliate interface. We built the most recent version of NATS to maximize the productivity of affiliate promotions, tracking referrals by date, site, campaign, program, consumer location, advertisement, and referring URL. The NATS 4.1 Affiliate Dashboard makes sure that all of this information is organized in a convenient and easy-to-use manner, so you'll never miss meaningful statistics. Start every day with the administrator overview report, which includes information about your recent transactions, top sites, top affiliates, newest affiliates, and your newest consumers. View Profit/Loss and Traffic & Joins graphs based on recent statistics on this page, and use the information here see what your most successful promotions are. 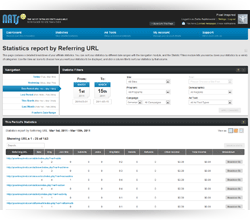 You can even flip the reports to find your least effective affiliates and sites. The metrics provided on this page let you get an idea of how your NATS promotions are doing overall. See what website URLs your consumers were redirected from, as well as how successful each URL was at converting your surfers into paying members. This helps you identify target audiences by analyzing the recorded statistics for each referral. Use this feature to break down statistics from your referring URLs by date, site, program, campaign, traffic tag, consumer location, or advertisement. Like the other affiliate statistics reports in NATS 4.1, you can see your reports in various views and reorder your statistics by any column. Make your affiliate program even better. NATS users have the widest variety of options for billing their customers. Check the full list of billing options.